New to song loops? Check out this overview video. 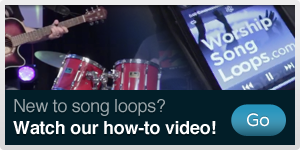 It's possible you have heard or read about using song loops in worship before. The problem is that to use loops (until today), you must also buy expensive new software and then set it up on your computer. Unless you're really technical and have sound engineering experience, you might be at it for a while! You don't need any new software to use our high-quality MP3 loop library of crisp drums, rich synths, and catchy rhythmic patterns which allow you to emulate many popular worship band styles. All you need is an mp3 player, like an iPod or iPad. You could even use your laptop! Easy enough to incorporate into your music set THIS Sunday. No technical expertise required! I don't think my church has PayPal. What do I do? Doesn't matter. You can still purchase with or without a PayPal account. Are your loops created for specific worship songs? No. We wanted to give you a diverse library of sounds with multiple tempos and keys that you can use for any context instead of just for one song. Why get boxed in? Are your loops meant to replace instruments in my worship team? Our loops are meant to complement and fatten your team's sound with your existing band – but it's really up to you how you use them. Get creative and do something fun! All of our loops are downloadable in mp3 format for use in an mp3 player or laptop. All you need is a direct box! Can I share these with my worship leader friends? Nope. Your license grants you the rights to download and use our loops in a live setting only (one account per church campus/site.) Please don't bootleg our loops! Can I use these loops in my next recording/live album/video/media project? Please contact us to purchase extended licenses for your recording/live album/video/media project. Can you make custom loops for my next recording/live album/video/media project? Please contact us to get a quote for your next recording/live album/video/media project.